After reading about Cameron’s plan to turn the lives of yoofs around it got me thinking about all the harebrained plans and policies I have to work with. In fact, right outside the office on a notice board there is one outlining our policy on Keyworking (a.k.a Support Working, Link Working just in case anyone finds the term Keyworking offensive they have options). The policy outlines all the different qualities that the resident’s personal assistant, sorry KeyWorker, should exude, thus instilling at a young age that the state is there to serve you before you have done anything in service of the state. Most notable of all though is the definition of what keyworking purports to do: “helping you to realise your goals in order to move forward in life.” This definition doesn’t allow for the fact that many of our 16-25 year old residents don’t have goals beyond getting as wasted as they can on a regular basis. This then involves me having to support them in setting some goals all the while being “careful not to impose one’s own value system” as one manager put it to me recently. The residents who don’t have goals never turn up for their Keyworking sessions and have to be threatened with eviction to engage in setting goals they don’t aspire towards. All of this is recorded, monitored and audited by layers of state financed bureaucrats. Then there are those residents, usually the older ones but not always, who have goals and aims and are progressing and just want to be left alone to do so which they should be permitted to do. They resent formal support plans that state obvious goals like: continue to pay your rent, go to work etc. etc. They can’t understand and neither can I, why all this needs to be written down and why they have to talk about it every two weeks for an hour. They feel patronised for having their lives interfered in and they are right. However, as they can’t afford to rent properties of their own due to unjust rents they are forced to adhere to the state’s ludicrous interference to qualify for a roof over their heads. It's not much after 9am. David has gone to work and I have done the week's grocery shopping, have today's washing on the line, the dishwasher is emptied, animals fed, beds made, a couple of blog entries before that and...the day is mine. I can read, paint, garden, walk the dog, study horse form, do a jigsaw with Sam. This post was prompted by a remark the checkout girl made to me earlier. (She's a student who has recently been studying in Leeds reading politics and art history). She said she wished her parents were as organised as I am. That they would do a proper shop instead of buying in dribs and drabs and that she had offered to do it for them but to no avail. I was surprised at her frustration but it caused me to reflect on why I am the way I am. It goes back to a teacher. She was deputy principal and an utter battle-axe. She would yank an illegal piece of jewellery off your neck if she caught sight of it. But she was very kind to me when I was in the sick bay - a monthly unpleasant occurrence. 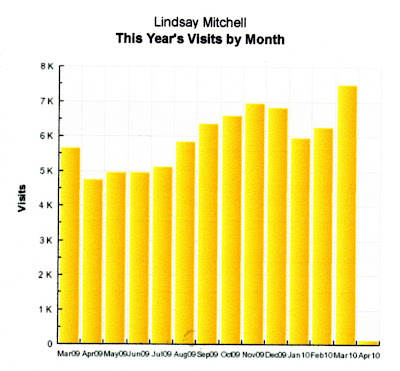 One day in assembly she told us that people regarded her as very efficient. "But you know what?" she said. "I am not. I am lazy. But I like to get what needs to be done out of the way so I can do what I want to do, which includes lazing around if I want to." In a practical sense that is the philosophy I live by. It was bloody good advice. Highly recommended article here for those people who can't tell the difference between liberals, conservatives and libertarians. I used to be a Kennedy-style "liberal." Then I wised up. Now I'm a libertarian. When I asked people on the street, half had no clue. We know that conservatives want government to conserve traditional values. They say they're for limited government, but they're pro-drug war, pro-immigration restriction and anti-abortion, and they often support "nation-building." And so-called liberals? They tend to be anti-gun and pro-choice on abortion. They favor big, powerful government -- they say -- to make life kinder for people. By contrast, libertarians want government to leave people alone -- in both the economic and personal spheres. Leave us free to pursue our hopes and dreams, as long as we don't hurt anybody else. Read through to the last lines because that is the crux of it for me. Boaz indicts the welfare state for the untold harm it's done in the name of the poor. "What we find is a system that traps people into dependency. ... You should be asking advocates of that system, 'Why don't you care about the poor?'" The latest Roy Morgan poll. Not that I was asked, but if I had been, my answer wouldn't be represented. We could try a mini (probably very mini on a Saturday) poll here. How many of you, if there was an election to be held next Saturday, don't know who you would vote for - or wouldn't vote at all? There is a danger I will return to my non-voting status. With a big difference. When I was young I didn't vote because I didn't know or care enough. What difference will whanau ora make? Dependence on benefits is a big driver of dysfunction. Benefits - or a guaranteed weekly payment from Work and Income regardless - absolve people from working for a living and having positive, constructive and co-dependent relationships with other whanau members. Benefits allow people to live outside of functioning society. Welfare services evolve as a response to this dysfunction. Services may ameliorate some of the problems but a significant reduction cannot be possible while the prime driver - benefits - remains unchanged. The taskforce report used an example of a working single mother whose children were going off the rails and was having to deal with various authorities. This example isn't typical however. The Early Start programme, the only programme that has systematically identified the neediest families, provided services to them and compared the outcomes to a control group that did not receive services, found 90 percent of their clients were on welfare. The problematic working mother does fit however with Tariana Turia's view that women should be allowed to stay on the DPB until their youngest dependent child completes his or her schooling. It is possible that Maori will be better providers of welfare services for Maori people. John Tamihere maintains his trust can reduce youth offending if given ample resourcing. But it is difficult to see by what mechanism whanau ora is going to ensure people 'meet their obligations' unless the trust also controls benefit inflow into the dysfunctional families they aim to assist. That eventuality may still be a whanau ora goal. In the past trusts or agents have been appointed to manage benefits. As it stands however there is no intimation this is going to happen. The report specifies that there is, "... no expectation iwi would fund core services such as health or unemployment benefits." The government claims that the 20 new whanau ora contracts will be a fiscally neutral policy. Funding will be drawn from the existing Health, Social Development and Maori Development budgets. This can only mean that there will be winners and there will be losers. We have yet to see which service providers are going to have their funding cut or lose it altogether. The whanau ora concept focuses on the family and their collective responsibility. But in my experience working in a voluntary capacity with needy families, there is usually one (or two) individuals that pull the whanau down. Who make their own problems everybody else's. For instance Corrections complains about imprisoned whanau members pressuring their relatives to bring drugs into prison. This can take the form of intimidation or physical threats. Hence the dysfunction multiplies. However the problem still begins with, and must be resolved by, the individual. Perhaps it is time to start talking more about personal responsibility instead of collective responsibility. When the US decided to grab welfare dependence and all the attendant dysfunction by the neck and give it a good shake they did so via new legislation called the Personal Responsibility and Work Opportunity Reconciliation Act(PRWORA). President Clinton told Americans welfare, as they had known it, would change. In the majority of cases welfare became strictly short term assistance, the aim being to restore the incentive to rely on one's own efforts and avoid self-destructive behaviours . Simply changing the way services are provided will only scratch the surface if the current benefit system remains unchanged. Turia has been appointed Minister of Whanau Ora. The media is billing whanau ora as potentially the biggest shake-up in welfare in decades. But whanau ora is about welfare services - not welfare cash transfers. There is nothing in the report released today that would indicate whanau ora providers will take over administration of benefits. How much can whanau ora be expected to achieve in terms of changing behaviour - or as John Tamihere would put it, getting beneficiaries/clients to meet their obligations - when services and benefits are separate? It is like tasking a group within a large company with lifting worker's productivity but giving it no capacity to penalise or reward either motivated or lazy workers. So while some are hailing this development as a great step forward, I will wait and watch. Whanau ora is about the whole of family approach. Personally I have seen high risk whanau where one (or two) bad eggs keep pulling others down. 'Blood is thicker than water' does not serve Maori well in this respect. So increasing the well-being of the whanau still rests on the individual and his or her efforts. The Age is reporting that the Australian Treasury has predicted their population will grow to 36 million by 2050. The roughly matches what the Australian Bureau if Statistics are forecasting as well. Australia's estimated resident population (ERP) at 30 June 2007 of 21.0 million people is projected to increase to between 30.9 and 42.5 million people by 2056, and to between 33.7 and 62.2 million people by 2101. Series A projects the highest growth, while Series C projects the lowest growth. Low fertility and the ageing of the large baby boom cohort have raised the prospect of slow or no growth in the future. Regardless of which projection is chosen, the general demographic outlook for New Zealand over the coming decades is for slowing growth, a narrowing gap between births and deaths, and an ageing population. This is a radical departure for a society accustomed to a growing population. Any innovative or expansionist planning or business programme must take account of structural shifts in progress. * there will be a net migration gain of 10,000 people each year from 2013 onwards. Given these assumptions, New Zealand's population is projected to grow from 4.32 million in 2009 to 5.15 million in 2031 and 5.75 million in 2061. There are people who celebrate low or zero population growth. I am not one. The economic reality is that dependency ratios are growing and without an expanding working-age pool (what might be expected from net migration) NZ is facing massive problems. Yesterday beneficiary advocate Paul Blair was back in the news claiming the Ministry of Social Development is acting illegally. He is trying to get people who have been relegated from an invalid's benefit to a sickness benefit to come forward and form a body that will take the department to court. Mr Blair describes himself as a qualified barrister. Listening to him interviewed by Sean Plunkett this morning he lacks the discipline and gravitas one might associate with that of a practitioner of the law. Three Rotorua beneficiaries have forced a law change for single parents with split custody of their children through an out-of-court settlement with the Social Development Ministry. On October 1, 1991, a law was introduced to stop two parents living apart, but who had split custody of their children, from both getting the Domestic Purposes Benefit. One was eligible for the sole-parent benefit and all the benefits that went with it, while the other was entitled to the unemployment benefit. Rotorua beneficiaries advocate and sole parent Paul Blair argued that this was not fair as the parent receiving the DPB was entitled to earn more when working than the parent on the dole. Parents on the DPB were also entitled to childcare subsidies, a non-recoverable training incentive allowance if attending a course, and did not have to be work-tested. Rotorua sole parents Leon Broughton, Richard Amoroa and Mr Blair started legal proceedings in the High Court at Rotorua against the chief executive of the ministry more than a year ago. In the out-of-court settlement, the ministry agreed the second parent in split-custody cases would be entitled to the emergency maintenance allowance, paid at the same rate as the DPB and with similar advantages. Justice Alan McKenzie ordered the ministry to review the plaintiffs' benefits, pay any arrears, treat all similar cases in the same way and review cases as far back as December 12, 2000. This is an utter distortion of how the DPB was intended to operate; the state paying for the mother (or father) to care for the dependent children while the liable parent contributes to this payment through earned income. Another Court of Appeal case, the Ruka Case, also saw the original intention of the DPB distorted by a ruling that stated where a women was living in a relationship with a man who was abusive and not financially or emotionally supportive she could not be legally described as 'living in the nature of a marriage'. Therefore she could continue to receive the DPB. Thousands of past decisions were scrutinised under the new ruling, overturned and financially recompensed. Note now that as long as a man is violent and doesn't support his partner she can stay on welfare. A bitter irony given an original aim of the DPB was to enable women to leave abusive relationships. Of course there are many other ways in which eligibility for the DPB has been distorted. These are just two of the more counter-productive examples. Some news for those of us who had to be forced to eat fruit and veges as kids, continue to force ourselves to eat fruit and veges as grown-ups and force our children to eat fruit and veges because THEY WILL MAKE YOU LIVE LONGER. All that angst and resentful compliance may have been a complete waste of time. However, having believed it for so long I am not about to relinquish my prejudice and share this revelation with the children. When they ask, "What's to eat?" my standard response will continue to be, "Get a piece of fruit." Once a lag, always a lag? A friend once described to me how she and two others had gone to prison to visit a gang president to 'buy' her partner's freedom. She stayed in the car but was quite explicit about the intent of the visit and which gang was involved. And I have no reason to doubt the story. I recalled this episode just now when reading about Jack Yorke, who similarly struck a deal to obtain his release. Looking at the region it may well be the same gang. Unfortunately for Mr Yorke, when the person with whom he had struck the deal died, new blood started demanding money to uphold the agreement. It's so despicable. Yorke, probably something of a wreck from hard living and on a sickness benefit, stole some property to pay the ransom. Then he confessed to the police. It was his first conviction in the 6 years since being released from jail. Now he is being sent back to prison for 15 months with "special release conditions to assist in rehabilitation." This raises a few questions in my mind. 1/ What, if anything, is being done about the blackmailing of Mr Yorke? 2/ What is 15 months in prison supposed to achieve? Would it be preferable to spend the $91,000 it costs to house a prisoner each year on buying Yorke a new identity and shipping him off somewhere? In prison it is going to cost 6 times what it currently costs to support him and the fact he stayed out of trouble after 2004 would suggest he is over his life of crime, worn-out most likely. 3/ If Mr Yorke is subject to threats and intimidation on the outside, what chance the authorities can keep him safe on the inside? 4/ And, of course, is Mr Yorke telling the truth, but I am prepared to give him the benefit of the doubt. But perhaps the hard-liners would say, tough. He has to be punished and if he didn't want to do the time, he shouldn't have done the crime. Perhaps Mr Yorke is about to get his comeuppance for his previous life of offending. And that is exactly where I part company from the hard-liners. Yes, I actually have some sympathy for this character because I imagine he is a burnt-out shell of a man who no longer poses a threat to society. There are plenty more like him hence very few old men are in prison. But more importantly the way the justice system is dealing with him seems to defy logic. There must be better outcomes available for both Yorke and the taxpayer. Surely. View the benefit type, age and regional breakdown here. Only 36 percent of them were on the dole. 35 percent were on the DPB. Just over 1 in 10 may not seem remarkable but in higher socio-economic areas the number will be negligible. And in the poorest areas the number will be around 4 or 5 in 10. That's where being on welfare is normalised behaviour. Is Work and Income toughening up? The story may also be the result of Rotorua beneficiary advocate and activist Paul Blair getting busy again. Paul Blair has previously taken the Ministry of Social Development to court in order to secure a rule change that allowed single parents to split the custody of their children, both go on the DPB and avoid work-testing. So what do statistics show? The March quarter statistics are not out yet. 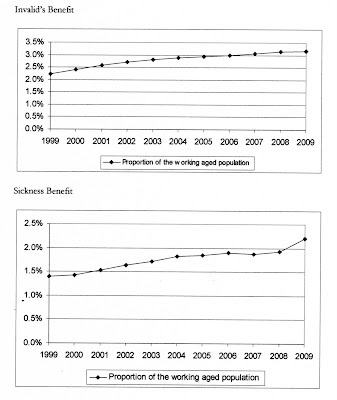 But those up to December 2009 show an increase in both benefits. Within that picture it is entirely possible more people than usual are being transferred from IB to SB hence the steep rise on SB. But the inflow onto IB is still greater than the outflow. 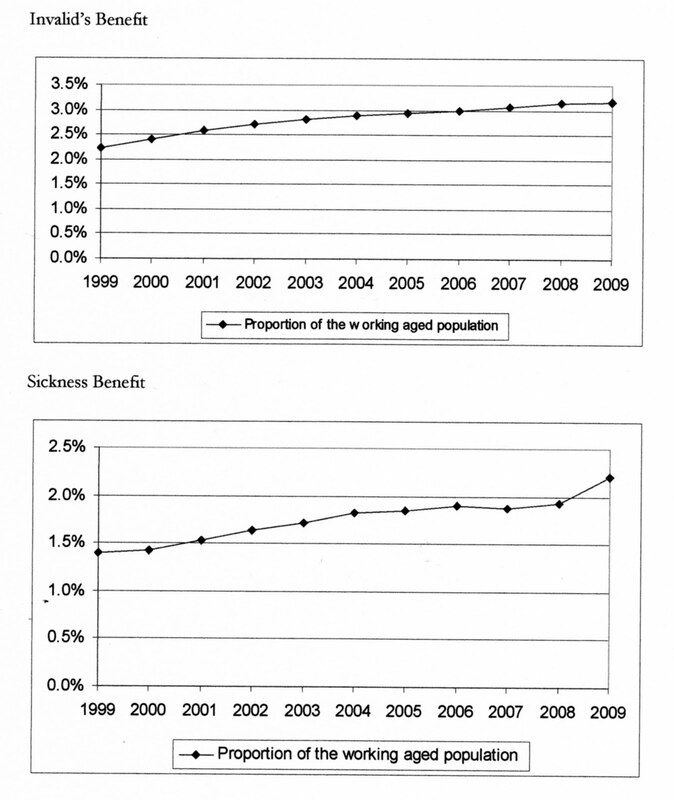 These graphs show that around 55 working-age people out of 1,000 rely on a sickness or invalid's benefit. This compares to 24 in 1991. Something has to be done to reverse the growth trend. Putting someone on a shorter term, lower paying benefit might provide the encouragement they need to look for a different or supplemental source of income. In NZ there around 4,500 people on the methadone programme. In Scotland, where the population is only 5 million, there are 22,000 on methadone. As my husband noted, there must be long queues at the pharmacies in the morning. It is no wonder that methadone has become a political football in Scotland but expense is a red herring. Methadone itself isn't expensive but the management of patients and dispensing adds up. A coalition of world experts in drug abuse have defended the use of methadone to treat heroin addicts and warned that curtailing its prescription would bring about a spike in overdoses, crime and HIV. In a letter to The Scotsman, the group, comprising dozens of international specialists, have condemned the "continuing misrepresentation" surrounding the effectiveness of the heroin substitute and rejected claims that is too expensive. The defence of methadone by the coalition of GPs, psychiatrists, counsellors and epidemiologists comes in the wake of growing criticism of the treatment and accusations that the Scottish Government has become overly reliant on the drug. Last week, Professor Neil McKeganey, the director of the Centre for Drug Misuse Research at the University of Glasgow, argued that more effort was required to get Scotland's addicts off drugs through abstinence. 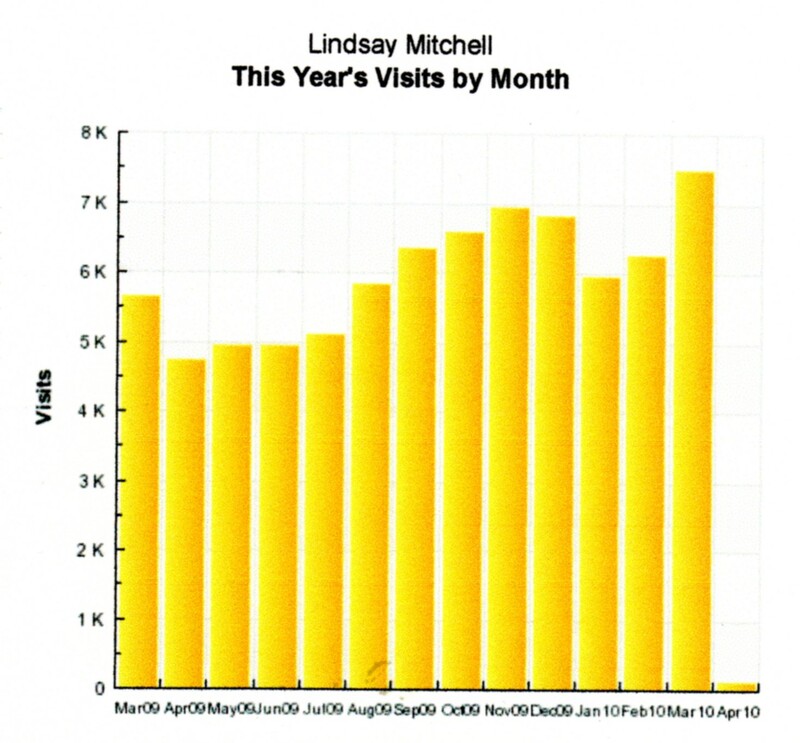 Last month there were over 7,000 visits. A new milestone. Ta very much. Feeling as though the Government is listening to them is one of the most important things to New Zealanders, but it is the area where the country scores the worst. The best remedy for this is not more democracy, more participation, more consulting, more select committees, more representatives, more commissions of enquiry, etc. It is LESS government. If government weren't so pervasive in all aspects of our lives its non-responsiveness would be less of a problem. Why are there race meetings all over Australia today sucking money out of shut-down NZ? Because NZ is a far more Christian nation? Or because NZ has more than its fair share of spoilsports? Or perhaps it is simply that Australia is a 'can do' country and NZ is a 'can't do'. Hence the growing economic gap. And what is the reward for being a 'can't do' country? Russell Norman? OBJECTIVE: The present study examined the role of socioeconomic status and cultural identity in the association between ethnicity and nicotine dependence, in a birth cohort of >1000 methods young people studied to age 30. METHODS: Data were gathered on ethnicity, cultural identification, nicotine dependence, and socioeconomic factors, as part of a longitudinal study of a New Zealand birth cohort (the Christchurch Health and Development Study). RESULTS: Those reporting Māori identity had rates of nicotine dependence that were significantly higher (p < 0.05) than rates for non-Māori. Control for socioeconomic factors reduced the associations between ethnic identity and nicotine dependence to statistical non-significance. In addition, there was no evidence of a statistically significant association between Māori cultural identity and nicotine dependence, nor was there evidence of gender differences in the association between ethnic identity and nicotine dependence, after controlling for socioeconomic factors. CONCLUSIONS: The higher rates of nicotine dependence observed among Māori appear to be attributable to differences in socioeconomic status. Efforts to improve the socioeconomic standing of Māori should therefore help to reduce rates of nicotine dependence in this population. Get your teeth into that. I don't believe poverty makes people smoke (accept that it is an affordable 'pleasure'). Why don't Pacific women, who have the same socio-economic status as Maori women, have a higher rate of nicotine dependence? Their smoking rate is the same as European women. And Asian women, the poorest, smoke the least. In fact, the more I ponder this, the more inclined I am to think it is being Maori, something about an attitude (how many of us smoked when we were young as either an act of rebellion or to fit in with mates) that makes their tobacco use higher. Like welfare, they start young and it is difficult to kick the habit. But that's just opinion. The science makes a nonsense of what I think. John Armstrong writes about the tensions within ACT. A favourite of the media and left-wing blogs at the moment. He describes the apparently, "... ugly body language displayed by Hide and his deputy Heather Roy towards one another on TV3's The Nation last weekend." One assumes that the ugly body language occurs between two people who are in the same space at the same time. Body language is very hard to disguise. So I thought I would have a look. I was under the distinct impression that the two had appeared on the programme, probably in the studio, together. I sat through 13 minutes waiting for something that never happened. In fact the whole thing is a story made up by TV3. Bits of it are true and bits of it are Stephen Parker overlaying his interpretation and asking questions he can then weave into the thread that says Heather wants the leadership. The stuff about Rodney - from an interview with Stephen Franks - not being a manager is twisted into 'Rodney is not managing'. What Rodney doesn't like managing is people. That's an entirely different thing. Heather does like managing people. Organising and planning. 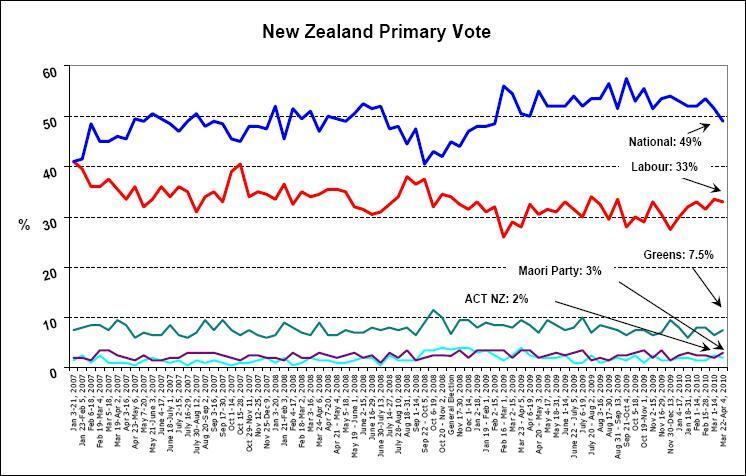 I think ACT was more successful when it was a group of individual MPs doing their own thing. But Heather likes team stuff. Unfortunately with people attracted to less government, strongly individualistic types, making them work together doesn't necessarily produce a synergistic effect. During my interview by the board pre 2008 election, when asked I replied that I am not a team player. Probably got me the chop. But it's true. And I don't think Rodney is. Muriel Newman certainly wasn't. Stephen didn't strike me as one either. They are ideas people who really don't enjoy the machinery of party politics. Rodney may not be a people-manager, or a team player, but he is the only MP capable of being ACT leader. Heather doesn't come close to possessing Rodney's charisma; his intellect; his oratory skills and sheer bloody single-mindedness. But there I go again buying the idea she even wants the job.